Early in Syria’s civil war, before the emergence of the Islamic State, the battle lines seemed clear. A local opposition was challenging an entrenched regime for the keys to Damascus. It soon became obvious, however, that neither side could win by themselves, and both dragged in allies whose ensuing battle for a broader supremacy has torn the country apart. The ramifications have been profound. At stake now, more than four years into the war, is far more than who gets to control Syria. The war is unlocking a regional order established almost a century ago. And two prominent forces, neither of them state actors, have emerged as power players. On one side are the Kurds, an ethnic group which missed out on a homeland when the Ottoman Empire was divided up at the end of the first world war. On the other is Isis, a marauding force of global jihadists, who have claimed a homeland from the ruins of the once feared police states of Iraq and Syria. Isis’s rampage across both countries has exposed the fragility of totalitarian rulers and their subservience to the region’s titans, Iran and Saudi Arabia. Other stakeholders, such as Turkey and the US – notional partners who had until now preferred to push their agendas via proxies – have been drawn in ever deeper, but for different and often contradictory reasons. The result has been a bewildering array of shifting alliances and priorities, none of which have helped ensure that the post-Ottoman states of Iraq, Syria, and even Lebanon, remain viable. For Ankara, the main foe has been the Kurds, who have fought an insurrection across Turkey’s south-east for the past 40 years. 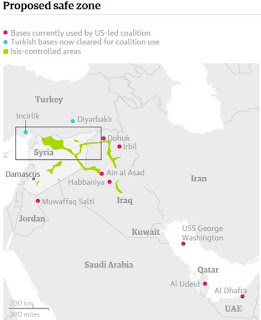 For the US and its allies in Riyadh and the Gulf, Isis is the enemy, whereas the Kurds have been their main ally - the only viable ground force in northern Syria and northern Iraq, where the battle against Isis rages. 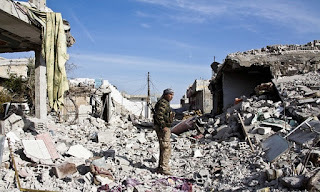 Turkey’s decision to directly join the fray was made against the backdrop of a suicide bombing last week which killed 32 people – many of the Kurds – in its southern city of Suruc, and was blamed on Isis. But another – and perhaps more compelling – reason, was an attack by the Kurdish militia, the PKK several days later, which killed two Turkish policemen. PKK officials have blamed Turkey for staging the Suruc attack and claimed the killing was their retaliation. Ankara has since insisted that the PKK represents a greater threat to its sovereignty than Isis even as it reversed policy and allowed the US to start using its Incirlik air base for air strikes against Isis inside Syria. It had resisted such a move for the past three years insisting first on a safe haven being established inside northern Syria, which would ostensibly protect Syrian civilians who have fled the chaos, as well as opposition fighters. The US, fearing it would be drawn into an attritional campaign that added to its existing load in Iraq, had refused. Now though, with some kind of safe haven seemingly on the table, it is the Kurds, not Isis, who control much of the north. The YPG-Syrian Kurds allied to the PKK in Turkey have influence from just north-east of Aleppo to the Iraqi border. They also control Irfin in north-western Syria. Isis controls the area between the Kurds – and it is here that the Turks want to enforce a safe haven, one effect of which would be to deny the Kurds in the north-east to link up with the north-west. “The Turks’ move last week is not about Isis,” said one senior Kurdish official in Irbil. “It’s about us.” As Syria has crumbled, Syria’s Kurds have quietly built an arc of influence that Turkey believes advances the broader Kurdish project of an eventual sovereign state carved from north-eastern Syria, south-eastern Turkey, parts of western Iran and what is now Iraqi Kurdistan. This has raised an unprecedented alarm in Ankara, which wants nothing less than an emboldened and spreading Kurdish enclave just across its border, which could link up with the semi-autonomous Kurdish north of Iraq. Turkey’s fear over the Kurds has led it to ignore its anger at what it sees as US prevarication in moving against Bashar al-Assad. It has done little to convince Washington, however, that it is serious about tackling Isis. Turkey’s approach to the group had until recently been to contain rather than confront. And, since the jihadist group gathered momentum, the US has been pressuring Turkey to seal its borders and to stop interactions with Isis officials, such as buying smuggled oil, which keep the terror organisation’s economy rumbling. Throughout the past four years, all stakeholders in the Syrian war, then the war against Isis in Iraq and Syria, have been trying to avoid one outcome – a breakdown of unitary borders that had bound together the centre of the region for much of the past century. A de facto partition already exists in Iraq, where the Kurds of the north and the Sunnis of Anbar are drifting ever further from central government control. Now, with Syria’s Kurds ascendant, hopes that the country as it is now may again be controlled from Damascus are also falling. All those involved are framing suggested responses to the chaos through their own interests, which rarely align even with allies and don’t amount to a strategy to stop the crumbling order. Isis, meanwhile, continues to build the semblance of a state from the chaos it has been largely responsible for causing. Even without being officially redrawn, the Middle East map is now very different.